The prepared text of Justin Trudeau’s speech upon being elected leader of the Liberal party. Normally I’d start by thanking family and friends for putting up with my absences and allowing me to go off and campaign, but that’s not exactly right. My decision to seek the leadership was never in spite of my responsibility to my family, but because of it. And therefore family and friends were always at the very heart of this campaign. We did this together. Thank you Xavier et Ella-Grace. To my fellow candidates, Joyce, Martha, Karen, Deborah, Martin, David, George and Marc, and to the thousands of Canadians who worked on your campaigns, I want to say: we are not adversaries but allies. Your courage, intelligence and commitment will continue to bring honour to the Liberal Party of Canada. And for the health of this party, the hard work he has done, I want to thank from the bottom of my heart, my friend, my colleague and a great Canadian Bob Rae. Bob, we continue to need your leadership, your wisdom and your unparalleled commitment to the country and to our party. This has been a great campaign. We are fiercely proud that it has been fueled by volunteers. More than twelve thousand Canadians stepped up. Thank you for your dedication to making this wonderful country even better. Like every effective organization, this one has had principled, brilliant, and generous leadership. Katie Telford and Gerald Butts. My friends and compatriots. Thank you for what you’ve done, for what you’re doing and for what we are going to do together. Rob and Jodi, George, Aidan and Ava, thank you for sharing Gerry and Katie with us. My fellow Liberals, it is with great respect for those who have stood in this place before me, and great resolve to do the hard work required in front of us, that I accept, with humility, the confidence you have placed in me. Thank you. All of you. For your trust. For your hope. For choosing to be part of this movement we’re building. And on this lovely spring evening in our nation’s capital, I am honored to stand with you, proud to be the Leader of the Liberal Party of Canada. Je suis fier d’être le chef du Parti libéral du Canada. My friends, this is the last stop of this campaign. But the first stop of the next one. Over the past 6 months, I have been to hundreds of communities from coast to coast to coast. I’ve met, talked with, and learned from thousands and thousands of Canadians. Mr. Harper’s Conservatives. And unimpressed that the NDP, under Mr. Mulcair, have decided that if you can’t beat them, you might as well join them. We are fed up with leaders who pit Canadians against Canadians. West against East, rich against poor, Quebec against the rest of the country, urban against rural. Well, I don’t care if you thought my father was a great or arrogant. It doesn’t matter to me if you were a Chretien-Liberal, a Turner-Liberal, a Martin-Liberal or any other kind of Liberal. The era of hyphenated Liberals ends right here, tonight. From this day forward, we welcome all Liberals as Canadian Liberals. United in our dedication to serve and lead Canadians. Unity not just for unity’s sake, but unity of purpose. Under my leadership, the purpose of the Liberal Party of Canada will be you. I promise that I will begin, spend and end every day thinking about and working hard to solve your problems. I know that you are optimistic about us, but cautiously so. You are, after all, Canadians. You know that hope is a fine thing, but that without an equal measure of hard work to back it up, it will be fleeting. So I know that you will judge us by the tenacity of our work ethic, the integrity of our efforts, and, come 2015, the clarity of our plan to make our country better. That is as it should be. I know how lucky I have been in my life. Lucky, most of all, to have learned so much from so many Canadians. To learn that, above all else in this country, leadership means service. I love this country, my friends, and I believe in it deeply. It deserves better leadership than it has now. So let us be clear-eyed about what we have accomplished. We have worked hard and we have had a great campaign. We are united, hopeful and resolute in our purpose. But know this: we have won nothing more and nothing less than the opportunity to work even harder. Work even harder to prove ourselves worthy of leading this great country. We should be deeply, deeply grateful for that opportunity. As your leader, I fully intend to make sure we make the most of it.Change can happen. Canadians want leadership that will work with them to make it happen. Be hopeful my fellow Liberals. Work hard. Stay focused on Canadians. We can lead the change so many people want. A better Canada is always possible. Together, we will build it. This is an edited transcript of an interview by Postmedia political columnist Michael Den Tandt with Justin Trudeau this past week at Trudeau’s warehouse-style, basement campaign office in downtown Toronto. The two spoke for about 30 minutes. Q. If you win (the Liberal leadership), what’s the first order of business on day one, after the victory, if there’s a victory? A. Starting to bring the lessons we’ve learned from this campaign about hard work, about reaching out and involving people across the country, to the operations of the Liberal party. That’s really at the centre of it. There’s also going to be, obviously, questions about what’s happening in Parliament, and opposition days, and Question Period strategy and we’ll get to that. Stephen Harper is speaking out on the tragic death of a Nova Scotia teenager, saying bullying is more than kids acting up – in some cases it is criminal activity. I stand before you a son of Quebec. A grandson of British Columbia. And a servant of Canada. These Canadians you just met are a few of the thousands I’ve had the honour to meet, to talk with, and to learn from over the past 6 months. Their stories are remarkable. Remarkable, because they are so common in Canada. With hope and hard work, every day Canadians live the values that unite this country. Optimism, openness, compassion, service to community, generosity of spirit. My friends, our party must be their party. We must convince Chanchal [who was in his introduction video] that we share his work ethic, his desire to serve, his optimism about the future. We must prove to Penny that we are in it for her. That we understand the burdens she carries, every day, to make life better for her kids, her neighbours, her community. We must build with Justine and Ali a country worthy of their dreams and show them that Canadians across our land already share the same values as Quebecers: integrity, openness and community engagement. To those who think that Canadians do not share common values, I encourage you to spend more time in this country. All of this country. My fellow Liberals, my message to you is simple. To lead Canada, we must serve Canadians. And we must prove it with acts more than words. I say that not as a son who learned it from his father, but as a father who every day learns that from his kids. The Conservatives have forgotten about the value of service. The only time they talk about “community service” these days is when it’s a punishment for a crime. And, anyway, the only person Mr Harper wants his caucus to serve is their leader. Well, that’s not good enough. We need to be a party of community leaders, devoted to community service. That’s why I am calling for open nominations for all Liberal candidates in every single riding in the next election. Mr. Harper is showing us how governments grow out of touch. Canadians are getting tired of the negative, divisive politics of the Conservatives. And are disappointed that the NDP, with Mr Mulcair, has decided that if you can’t beat them, you might as well join them. Mr. Mulcair and Mr. Harper are masters of the politics of division. They are content to exploit differences and disagreements to further their own interests. East against West, Quebec against the rest of Canada, the wealthy against the less fortunate, cities against regions, and so on. This is old politics. But in the short-term, it can work. It was how Mr. Harper’s government was elected. We need to be better than that. We are an optimistic, hard-working, problem-solving people. Canadians want a positive alternative that brings new solutions, new ideas, and a new way of doing politics. 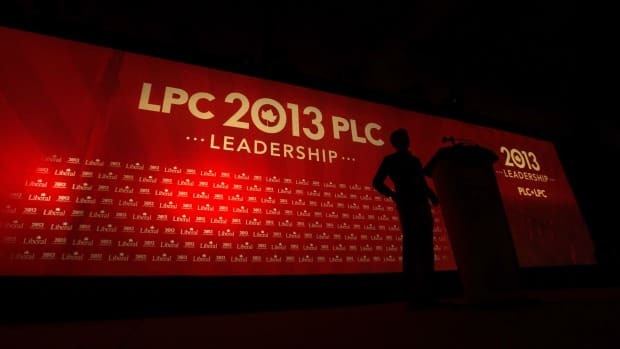 I’m more convinced than ever, that if we work hard every day between now and then, the Liberal Party of Canada will be that positive choice in 2015. So let me be perfectly clear on one point. I want to be your leader because I want work with you, and with millions of Canadians, to build that positive alternative to the Conservatives. One that Canadians will choose freely because we will have earned their trust. Canadians don’t just want a different government. They want a better government. Those who think we need to win at any cost – whatever the means – are mistaken. It is a mistake to believe that just getting rid of this government will make all of Canada’s problems disappear. This is a naive and simplistic way to approach our future. We are facing real, and significant challenges. Middle class Canadians have seen their incomes stall, while their costs go up, and their debts explode. Simply getting rid of Mr. Harper will not get them their first real raise in 30 years. Young Canadians will not get jobs just because Mr. Harper is gone. Quebeckers will not automatically re-engage at the heart of our federation simply because Mr. Harper is no longer Prime Minister. Our international reputation on the environment will not be restored the day after Mr. Harper leaves. The truth is, Canadians want to vote for something, not just against somebody. They want to vote for a long term vision that embodies our values, our dreams and our aspirations. They will not get that vision from a Frankenstein’s monster, at war with itself over fundamental issues like the Constitution, Natural Resources and Free Trade. It would fail in its primary goal: it would extend, not end, Mr. Harper’s career. From Ponoka Alberta, to Île-des-Chênes Manitoba to Edmunston New Brunswick, Canadians are hoping that we have learned that lesson. Over the course of this campaign, I began to describe for Canadians a vision of this country that is very, very different from this government’s. Our highest economic objective will be prosperity for the middle class, and those Canadians who are working hard to join it. Our grounding principle will be equality of opportunity. Our agenda will develop our skills, support our vulnerable, attract investment, and expand trade. It is a vision that embraces diversity. One that recognizes Canada is strong because of our differences, not in spite of them. One that believes deeply in federalism, balancing national priorities with regional and local means of meeting them. A vision that sees newcomers to this country as community– and nation-builders; as citizens, not just employees, or a demographic to be mined for votes. Ours is a vision that knows economic prosperity and environmental health can – and must – go hand in hand in the 21st century. We will not ignore science, or shy away from tough, urgent issues like carbon pricing. Nor will we succumb to easy politics by demonizing one sector of the economy or region of the country. A Liberal Party led by me would never use western resources to buy eastern votes. We will stand for national unity by offering Quebeckers and all Canadians a progressive political project that rallies us all. We will be audacious and ambitious, because this country is greater than the sum of its parts. Our foreign policy will promote peace, democracy and development. Canada must be a key player on the world stage, bringing forward positive debate and discussions – not divisive ones as is the case today. My fellow Liberals, make no mistake about it. With me as your leader, you will get a clear, positive vision for Canada. We’ve begun to lay it out in this campaign. We’ve focused on the big issues like the prosperity of the middle class, a healthy democracy and sustainable economy. It’s a vision that you and I are going to finish, together, with Canadians. That is doing politics differently. If we work hard and stay optimistic, we will put forward an irresistible alternative to the Conservatives 30 months from now. Irresistible not because it is Liberal, but because it will be 100 per cent, undeniably Canadian. It won’t be easy. Nothing worth doing ever is. But that is the path to victory in 2015. Hope, my friends, yes. Always hope. But more than that. Hope and hard work. You see, the biggest problem with Mr Harper’s government is not that they’re mean-spirited. It’s that they’re unambitious. After all, what is the Conservatives’ economic message these days? That Canadians should be happy we don’t live in Europe? What’s worse, the Conservatives use our challenges as opportunities to demonize their opponents and divide Canadians, not to find solutions. It is up to us, the Liberal Party, to say that the Conservative way of doing politics is not good enough. Canadians are better than their politics, Canada deserves far better. Now, there are those who ask me: what makes you think you can take this on? To them, I say this: I have lived and breathed every square kilometre of this country from the day I was born. I’ve lived and worked in the east and the west, in French and in English. I am proud to have lifelong friends, colleagues and supporters from the Arctic archipelago to Point Pelee. And I have met, talked with, and learned from more Canadians in the past six months than Mr Harper has in the past six years. I have been open to Canadians my entire life. And because of that, I have a strong sense of this country. Where it has been, where it is, and where Canadians want it to go. And what is it with Conservative attacks on teachers? They’ve never met a teacher they wouldn’t pick a fight with. I am fiercely proud to be one of the hundreds of thousands of Canadians who belong to the teaching profession. And let me tell you this, my friends, this teacher fully intends to fight back. In closing, I want to share a story with you. Many of you know that today marks an anniversary. Exactly forty-five years ago tonight, a gathering of Canadians made my father Leader of the Liberal Party of Canada. Many Canadians have approached me over the course of this campaign to share stories about my dad. So let me tell you a special one. I met Constable Jeff Ling at Loyalist College in Belleville. It was at the end of a long morning. Constable Ling came up to the front of the room to give me a gift. I recognized it instantly. It was a picture of dad and me. You’ve probably seen it. I was about 2 years old and dad was hurrying up to Rideau Hall, with me tucked roughly under his arm. Both Dad and I are looking at an RCMP officer. He’s dressed in full uniform and saluting us crisply. That picture means as much to Jeff as it does to me. Because that officer was his father. What moved me was that here Jeff was, serving his country a generation later, with the same dedication and quiet pride as his father. In that moment, he evoked the thousands of Canadians I had the unique honour of growing up with. Men and women for whom service to Canada was its own reward. I know there are those who say this movement we’re building is all about nostalgia. That it’s not really about me, or you, or Canada. Let’s face it: they say that it’s about my father. It is. It is about my Dad. And Constable Ling’s dad. And our mothers. And yours. It’s about all of our parents and the legacy they left us. The country they built for us. Canada. But we know now what they knew then. It’s more about the future than the past. It is always, in every instance, about our children more than our parents’ legacy. That with hope and hard work, we can make progress happen. That we can leave a better country to our kids than we inherited from our parents. Progress. That is the core value of the Liberal Party. That is why generations of Canadians, from every corner of our land, and every walk of life, poured their heart and their soul and their ideas and their sweat into our Party. I said back in October that the Liberal Party didn’t create Canada. Canada created the Liberal Party. Well, the last six months have taught me that maybe, just maybe, Canadians are willing to do that again. We can lead the change that so many Canadians want to make happen. I’m asking you for your time, for your smarts, for your hope, and your hard work. And this week, I’m asking for your vote to become the next leader of the Liberal Party of Canada. Join me, join us, and our work will make us proud. Believe, now and always, in our country.